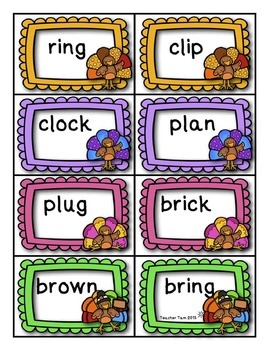 Adorable turkey graphics + a simple game + short vowel words = fun reading practice! This card game features CVC words and words with blends and digraphs. Directions for 2 versions of the game are included to accommodate younger learners. I have found that a straight-forward, simple matching game works well with my preschoolers, while my kinders prefer the more advanced card game. 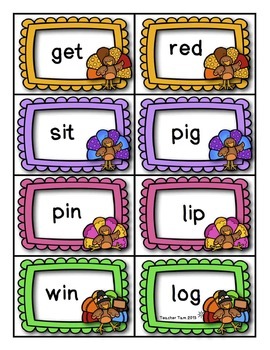 Either way, students will enjoy playing this engaging, Thanksgiving-themed reading game! * 1 Editable page so you can add your own words! RF.K.3b Associate the long and short sounds with the common spellings (graphemes) for the five major vowels. RF.K.3d Distinguish between similarly spelled words by identifying the sounds of the letters that differ. L.K.2c Write a letter or letters for most consonant and short-vowel sounds (phonemes). RF.1.3a Know the spelling-sound correspondences for common consonant digraphs. L.1.1a Print all upper- and lowercase letters. *Common Core Standards © Copyright 2010. National Governors Association Center for Best Practices and Council of Chief State School Officers. All rights reserved.